These are especially designed for quick fitting into moulds or surfaces where the use of rivets is impossible. Our cartridges come with low surface watts and are most suited for moderate heating; up to a maximum temperatures of 360C. The square tube is made of 304 quality stainless steel. All the tubes are perfectly designed both inside and out, into which a long-life ceramic bobbin is inserted. The cartridge is designed for continuous temperature variation and has the best possible thermal conductivity, as the ceramic piece is in contact with the wall of the tube, which makes for the best distribution of heat possible. The heater wire is within the ceramic piece. The nickel-chromium heater wire is of highest temperature class and is used in the manufacture of cartridge heaters due to its excellent performance at high temperatures. Everything inside is coated with fine graded magnesium oxide powder. 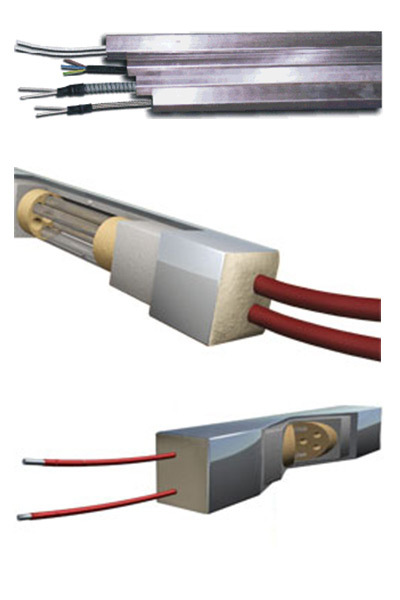 Therefore it has excellent conductivity between the heater wire and the object to be heated. Our manufacturing system, together with its CAM system, makes it possible to separate the spirals, thereby guaranteeing the same temperature around the whole section and length of the cartridge. Obtaining an uniform and lasting temperature output. Current leakage (when cold) <=0.1mA to 242 v.
Insulation (When cold) <=5mA. to 500v.